In seventh pAsuram – AzhwAr, thus desiring to see emperumAn, when emperumAn showed interest in being together, again thinks about emperumAn’s great stature and his own lowly stature and leaves emperumAn again. AzhwAr having reminded about previous consideration of himself being lowly, thinks “I am so ignorant, How can I long to see emperumAn who is so simple, so enjoyable and great? What foolishness in my part?” and again tries to shy away. Seventh pAsuram – AzhwAr said “naivan“; Not wanting him to suffer, emperumAn appeared to him; Seeing him, AzhwAr says “I need not add any more glories to him” and leaves him. uNdE – is it there? emperumAn is the one who appeared as krishNa, who is difficult to know for even the wisest, who is wearing cool/beautiful thuLasi garland which has abundant fragrance, who removes the abundant sins of his devotees and protect them. I who have very little knowledge, long to see such emperumAn and call out for him – what is greater foolishness than this? 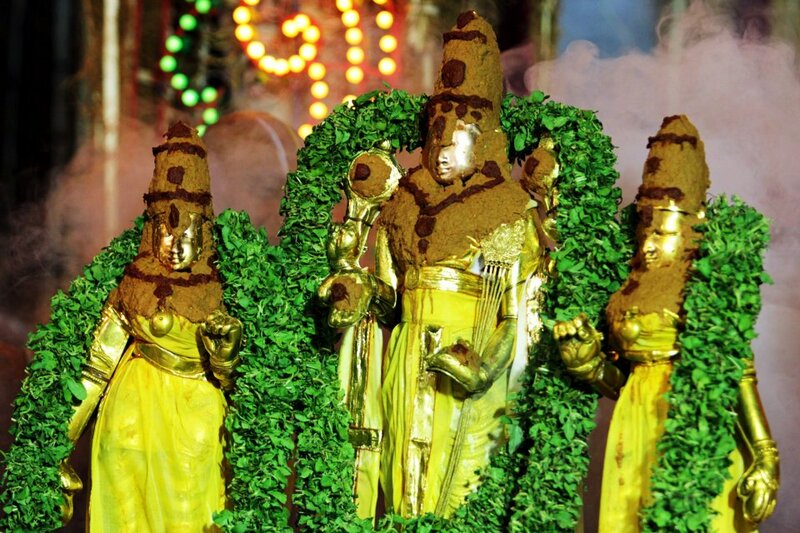 adiyAr – indicates great devotees – since in the first line AzhwAr said “adiyEn“, this “adiyAr” group includes AzhwAr too. sediyAr Akkai thIrkkum thirumAlai – this is also explained as emperumAn helping kaivalyArththis (those who are focussed on enjoying ones own AthmA). adiyEn siRiya gyAnaththan – Amongst samsAris (materialistic persons), there are some ignorant persons. I am so ignorant that, in comparison to me, they would look like all-knowing (super-wise). AzhwAr is not saying adiyEn wanting to perform service, but based on the realization that AthmA’s true nature is to be a servant as much as to be knower and enjoyer. siRiya gyAnaththan – having very little knowledge. aRithalArkkum ariyAnai – Even for the wisest person, he is difficult to comprehend; Even for himself who is “svathassarvagya” (naturally fully knowledgable), his glories are not comprehensible as explained in thiruvAimozhi 8.4.6 “thanakkum than thanmai aRivariyAn” (he himself does not know his full glories [this is not a limitation since his glories have no upper limit]). Combination of myself (adiyEn siRiya gyAnaththan) and bhagavAn (aRithalArkkum ariyAn) is like thamas (darkness) and prakAsam (brightness). kadi sEr thaNNanthuzhAyk kaNNi punainthAn thannai – rich in fragrance – This thuLasi garland is a key identity for bhagavAn (who is difficult to be comprehended). “sEr” is explained in present tense that “day after day the fragrance increases” and one who wears such garland. kaNNanai – though being incomprehensible, he made himself easily approachable by cowherd boys and girls. sediyAr Akkai adiyArai sErthal thIrkkum thirumAlai – Body which is filled with sins. It is explained in periya thirumozhi 9.7.7 “nOyalAm peythathOr Akkai” (body which is affected with all types of diseases). As explained in gIthA 7.14 “jarAmaraNa mOkshAya mAmAsrithya yathanthi yE…” (Those who surrender unto me and try to be free from birth, death, etc., they realise everything about the AthmA) – kEvala (one who desire for kaivalya mOksham of enjoying oneself eternally) is also protected/delivered by srImAn (the divine consort of srI mahAlakhsmi). Are they adiyArs (devotees)? In AzhwAr‘s opinion, they are the true adiyArs. How is that? sEsha bhUtha (servitor) means one who brings glories to sEshi (master). Unlike me who approach emperumAn and bringing disrepute to him, they get relieved from samsAram (by his grace) and stay away from him (without causing disrepute to him) – so they are true adiyArs. So, what happened to you now? adiyEn kANbAn alaRRuvan – I am crying out “adiyEn” (I am a servitor), “kANbAn” (want to see him). ithanin mikkOr ayarvuNdE – When I was a samsAri (materialistic – in previous births), being ignorant was blissful. How was that good? At least, back then, I stayed away from bhagavAn without causing disrepute to him. Now, I am trying to approach him and cause disrepute to him. What is more foolish than this? This entry was posted in thiruvAimozhi, thiruvAimozhi 1st centum on August 15, 2015 by Sarathy Thothathri.